Four people witnessed a strange UFO while travelling north to Mexico City. The passenger was the first to see it and pointed it out to her husband who was driving. It was described first as looking like a helicopter, but as it got closer it became something much more strange. He pulled over and captured a single photo using a 50mm lens. The object then started to move away, he swapped to a 135mm telephoto lens and took two more photos of the object. It was reported the object rotated to project its “tentacles” downward and landed. The witnesses said a bridge with two children on it could be seen behind the landed object, and one of the children began running to the site. That’s when the witnesses took off. The investigator interviewed the four and found them to be serious people with zero interest in the UFO topic. Film negatives were examined by Roberto Padilla, Special Services Director for Kodak of Mexico and it was determined that a real object was photographed with no evidence of faking or fraud. 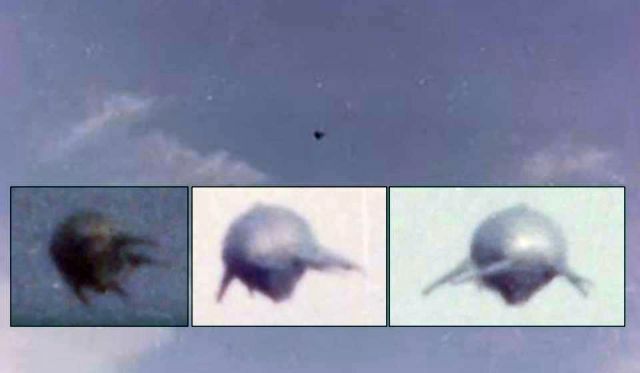 The strange UFO sighting has been reported on November 3, 1973 - OpenMinds.tv UFO Photo Archive. That is most highly detailed photos iv'e ever seen very real! !